Starring Sam Longley, Sean Walsh, and Damon Lockwood. Shakespeare WA and Cut Snake Comedy presented our own universally acclaimed production of the West End’s long running smash-hit parody of all of Shakespeare’s plays entitled The Complete Works of William Shakespeare (Abridged), by Adam Long, Daniel Singer and Jess Winfield, performed by arrangement with Hal Leonard Australia Pty Ltd. Reviews from the short run at Subiaco Arts centre earlier this year proclaimed our production to be “a hilarious romp through the bard’s oeuvre” and “side-splitting performances” (ArtsHub). Carol Flavell Neist in Arthub: Longley’s timing was breathtaking. It takes a consummate actor to turn a laughing audience into a serious one in the space of a couplet, and I, for one, stand in awe of his skill. . .. We went home laughing. Amy Welsh in Australian Stage: Shakespeare as popular entertainment for the masses, and finally, a brilliantly entertaining night out. It really was Shakespeare as it should be done; not too serious, and with the audience firmly in the palm of the performers’ hand, sharing the experience. Julie Herne in The Australian Stage: The three actors had a brilliant rapport and comic timing that kept us in stiches all night. Robin Pascoe in The West: The enthusiastic and whooping opening-night audience buoyed the performers along, encouraging their frenetic pace and madcap mugging. Sarah McNeil in The Post: A marvelous romp. Luke LeCras in Theatre People: There is rarely a moment throughout the show that is bereft of laughter. 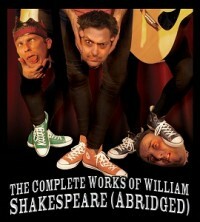 Director Paige Newmark, the cast and crew should be commended for creating a unique and hilarious spin on the English language’s most famed playwright.